After being dismissed from court in June 2012, Liberty University’s lawsuit against President Barack Obama’s health care law will be reconsidered in the fourth U.S. Circuit Court of Appeals in Richmond, Va., according to a Supreme Court announcement Monday, Nov. 26. Liberty filed a petition for rehearing, challenging the mandates for individuals and employers found in the bill and also raising the Free Exercise of Religion defense stated in the First Amendment and the federal Religious Freedom Restoration Act. When President Obama signed ObamaCare into law March 23, 2010, Liberty University filed a lawsuit against the new bill. This was the first private suit in the country. Staver and Liberty Counsel filed the suit on behalf of Liberty and other private individuals. “Originally, the court of appeals did not reach the merits but instead ruled that the federal Anti-Injunction Act (AIA) barred the court from ruling on the case,” Staver said. The AIA requires that if the law imposes a tax, the tax must first be paid before the suit can be filed, which in this case would have been after 2014. However, Liberty Counsel petitioned the U.S. Supreme Court, and the first of the three days of oral arguments dealt with their case, Liberty University v. Geithner. The Supreme Court ruled in their favor but then dismissed the case in June 2012. There are three main arguments supporting the case. The first is the challenge to the employer mandate for all employers, religious and secular. “If we win this challenge, ObamaCare will be disabled,” Staver said. The second focuses on the constitutionality of the law under the First Amendment Free Exercise of Religion and the federal Religious Freedom Restoration Act, because it forces religious employers to fund abortion. The third argument challenges the individual mandate on the same basis as the employer mandate because it too requires individuals to fund abortion. Because of the media currently focusing on this issue, Liberty has been featured in top news stories around the country. “We have received emails and phone calls from around the country and the world, thanking Liberty University for taking on this challenge,” Staver said. Liberty Counsel will soon receive a briefing schedule from the court of appeals and file their briefs. They expect discussion to take place after the new year with a decision being made in spring 2013. 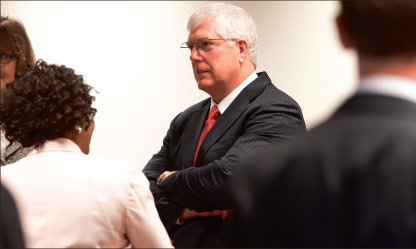 “We could be back before the Supreme Court in the fall of 2013,” Staver said. Please keep use informed. It’s important that this fight be continues in order to rid this scourge from society. This was forced down our throats by Democrats who care little for the people. Judge Roberts should be held accountable for his actions. All in Federal Government should have term limits.